The January snow disappeared as if by magic and I don't know about you but I can't wait for February to arrive and spring to edge forwards. Here are my happy moments from the last dark days of January. ♥ Spicy carrot soup - a lovely warming treat today at lunchtime. 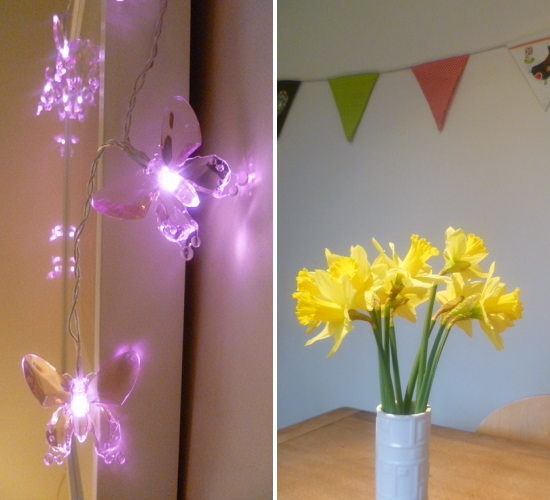 ♥ My wall art taking shape with butterfly lights to brighten my work area. ♥ I can't resist daffodils at the moment. ♥ Mini cups of hot chocolate. Yum. Hoping your week will have some happy moments too. Such pretty lights! You have made me want to have some hot chocolate now! Have a lovely evening! Your happy moments are always fun to read Claire as is your list of simple pleasures. Mine this week are having coffee with my husband and friends,catching up with my daughter and son and going to the theatre - but the important thing is to be aware of one's happy moments and your posts encourage me to reflect on that. Lovely, simple happy things this week. Like you, I am eager for spring to hurry up and arrive now that the snow has gone. Spicy carrot soup, my favourite! It's been dumping snow for two days straight here so I don't think Spring is anywhere close for us . . but I keep reminding myself that it will come, eventually. Your soup looks tasty. I love soup in winter. I could eat it for every meal. Your spring edges forward in February? Must be nice... ;-) We're having one ice storm after another here--I haven't been to work yet this week!